Ambassador (R) Ömer Engin Lütem graduated from the Faculty of Political Sciences, University of Ankara in 1957 and became career diplomat in the same year. 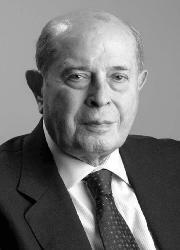 During his service at the Ministry of Foreign Affairs, Ambassador (R) Lütem had served as the Turkish Consul General at Cologne, Germany (1975 - 1979), Director General of Personnel of the MFA of the Republic of Turkey (1979 - 1981), Director General of Intelligence and Research of the MFA of the Republic of Turkey (1981 - 1983), Ambassador of the Republic of Turkey to Bulgaria (1983 - 1989), Deputy Undersecretary of the MFA (1989 - 1992), Ambassador of the Republic of Turkey to the Vatican (1992 - 1995) and the Permanent Representative of the Republic of Turkey to UNESCO (1995 - 1997). After his retirement in 1998, he served as the Director of the Institute for Armenian Research at Eurasian Strategic Research Center (2000 - 2008) and Director of the Center for Eurasian Studies (2009 - 2012). Ambassador (R) Ömer Engin Lütem was the editor of the journals Ermeni Araştırmaları (Armenian Studies; published between 2001 - 2017), Review of Armenian Studies (published between 2002 - 2017), and International Crimes and History / Uluslararası Suçlar ve Tarih (bilingual in Turkish and English; published between 2005 - 2017). The Founder and Honorary President of the Center for Eurasian Studies (AVİM) Ambassador (R) Ömer Engin Lütem passed away on 6 January 2018.